Applicable in many countries: Australia, China, Argentina, New Zealand, Cook Islands, Fiji, Samoa. 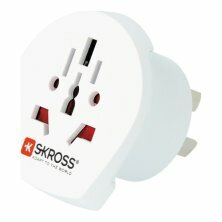 Receptacles for: Switzerland, Italy, Brazil, UK, USA/Japan, Euro. You want to explore the Great Barrier Reef in Australia or the Great Wall of China? Then this country adapter will be your perfect companion!